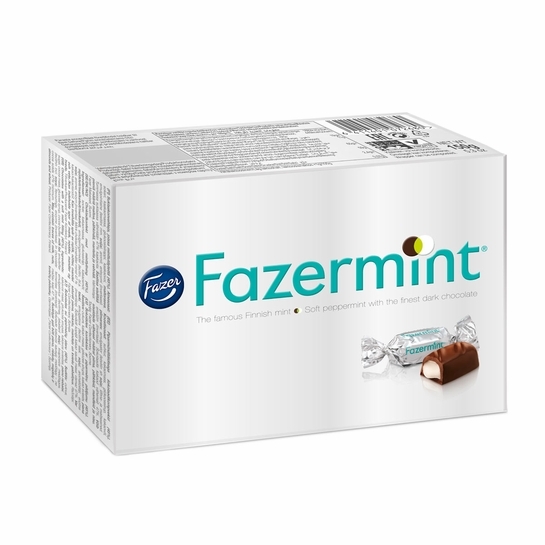 More about Fazermint Chocolate Creams Box - 5-1/4 oz Refreshing peppermint filling covered in decadent dark Fazer chocolate is the perfect way to treat yourself or loved ones. Fazer chocolate is made from fresh milk and high quality cocoa beans and is paired with cream made out of real peppermint for a rich, authentic taste. Originally created in 1961, this candy remains Fazer's best-known premium product. You recognize the Fazermint design by its silver packaging with the green logo and instantly know its quality. Ingredients: Sugar, cocoa mass, glucose syrup, cocoa butter, milk fat, dried skimmed milk, emulsifier (soya lecithin), flavourings (peppermint oil, vanillin), enzyme (invertase). Chocolate contains cocoa solids 47 % minimum. May contain traces of hazelnuts. Our family loves Fazermints. The dark chocolate outside is a wonderful contrast to the cool mint taste. The only reason we give them 4 stars is for the outside paper wrapper. It practically falls apart while unwrapping the candy. ProsHigh quality dark chocolate coating. ConsPaper wrapping is fragile and falls apart during unwrapping. Frazermint ~ the creamy European treat! 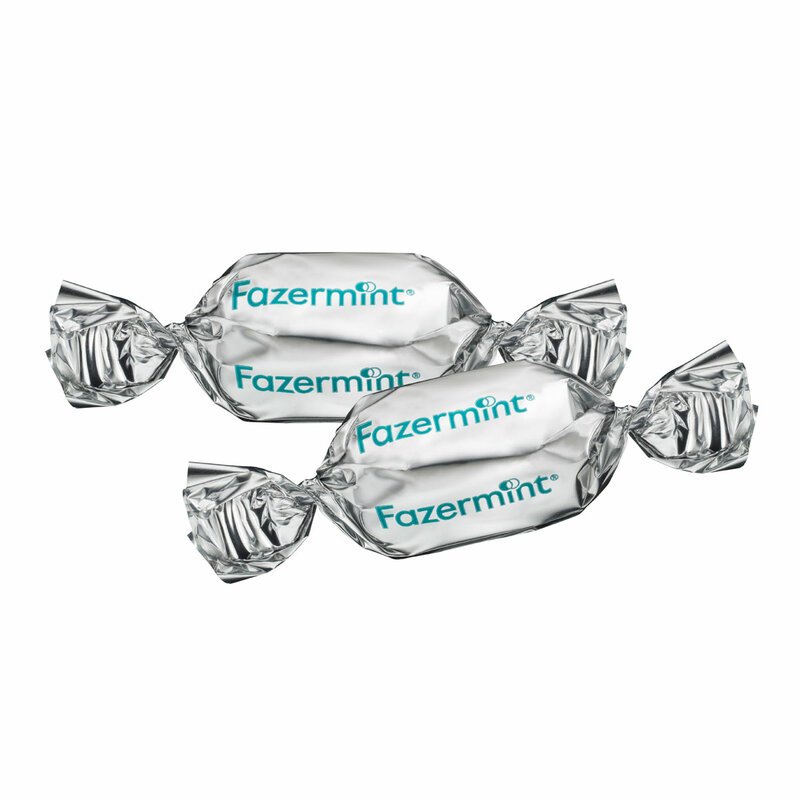 I first tasted Frazermints on a trip to Finland in 1980, just before graduating from university. We were there to meet many, many relatives on the west coast, in Osterbotten. Tasting Frazermints again after all of these years reminded me just how much I loved the minty taste and creamy filling as we made our way via Silje or Viking line across the Sea of Bothnia to Helsinki so long ago. It was so wonderful to share this box of Frazermints with my two kids who have yet to visit Finland and Sweden with me. The Fazermint chocolates were as delicious as I remembered. The box is very decorative, and would make a nice gift. Oh my goodness..... Never had these before and they are simply delicious. Melt in your mouth mint. I could buy these by the barrel if I were a millionaire!!!!!! Every one out there, give them a try. The best mints Iâ€™ve had in a very long time, will definitely get more of these! The mints arrived when promised and were fresh. I wish I could buy them locally. Not everyone loves chocolate, but the non-chocolate eater in our family canâ€™t wait to have these lovely chocolate mints every Christmasâ€”along with those who love chocolate! If you like dark chocolate and mint this little candies are the right choice. I love to keep them around for the quick chocolate fix. I think this candy is ok. Didn't really enjoy the minty taste and it is way too sweet for me. But it is reasonably priced and it is good to try something different. Fazermint Chocolate Creams is a wonderful treat of the best chocolate with a mint cream surprise inside. Finnstyle has the best price for these Finnish Fazer Chocolates. Good chocolate quality. Very fresh and creamy on the inside with a clean, natural, not-overly-sweet mint flavor. I haven't found a mint that tops this one! Maybe more expensive ones equal the taste experience, but these are the best available for a very reasonable price. Why buy any others? My husband's favorite...hard to find in the US, but now we can order from FinnStyle! Have to order these every few months especially around Christmas. I bought several boxes as gifts. They are very light, but very good! This is such a delicious dark chocolate with a smooth and creamy center that is just the right amount of mint. the combination of flavors is incredible. Fazermints are the best there are. They used to sell them at "Smart and Final" here in California, but for some reason have not had them on the shelves for quite a few years. i was so glad to find them at FinnStyle and can once again enjoy them. Most delicious chocolate mint creams ever! Every year around the holidays, if I place a Finnstyle order (and somehow I always do! 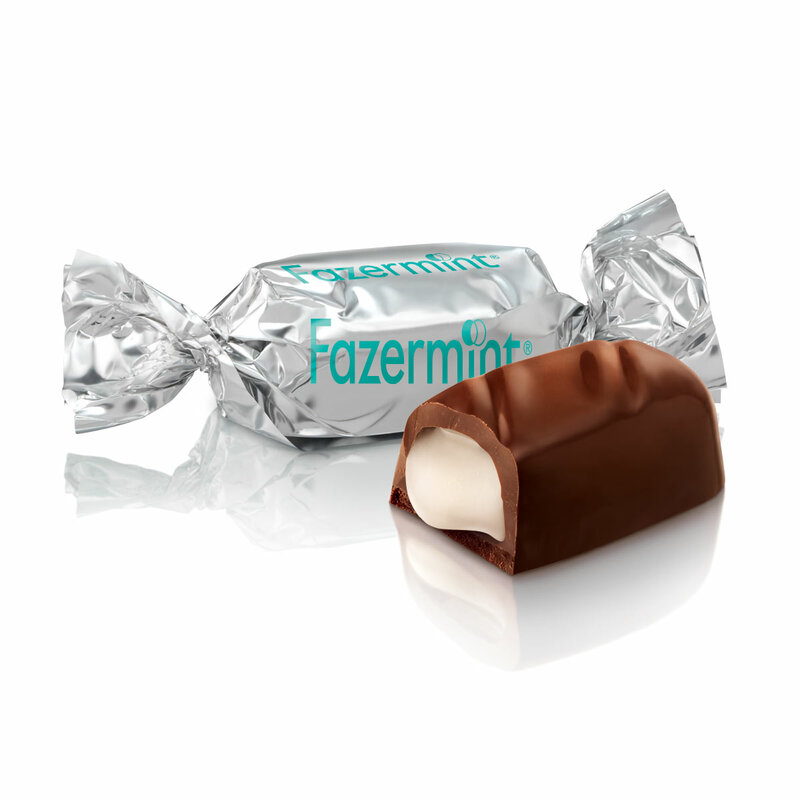 ), a box of these Fazermint chocolate creams is always part of my order. It's my holiday gift to me! :-) The bittersweet chocolate is high-quality and the mint cream is smooth and delicious. I don't eat a lot of candy these days, but I make an exception for these. In addition, they always arrive in perfect condition from Finnstyle. I wanted to get something for my clients in the US and knowing that they have kids, I thought that chocolate would be a great option. FinnStyle's selection and prices are very reasonable and the purchasing process was super-easy! Everything that I ordered got their on time and my clients were able to enjoy their delicious Finnish confectioneries with a hot cup of coffee, as I recommended they do :) Kiitos FinnStyle! ProsOutstanding flavor! An absolute favorite! Fazer mints are the best! ProsDelivery was prompt . No complaints, I will purchase from Finn again. Good website for ordering, fast service (as long as it's not prior to Christmas). One of the very few places I can still find this marvelous candy. The dark chocolate outside is rich but not overly rich, just right, and the smooth creamy mint is just the perfect flavor and texture to make this candy incredible! I love mint and chocolate but this is by far my favorite combination of the two! Very different from the typical mint chocolates out on the market, unique and delicious! These really melt in your mouth, not at all like some chocolate mints that are commonly stocked in grocery stores, well worth the special order. Decadent dark chocolate with creamy mint inside! These candies are wonderful. We enjoy them very much. Great service, quick delivery, packaged well, great price, and yummy. Would like to order in bulk than buying the individual 150g box but will definitely reorder especially when they have sale their price. ConsOffer buying in bulk for this product, but it is NOT a "con"
Theses mints are the greatest melt in your mouth!!!! So glad that we are able to find these again after so many years. Prosshipping was right on time as stated. Creamy mint - dark chocolate, what is there not to love about this candy. Hard to find - expensive - but worth it. HARD TO FIND FAASEDRMINTS AVAILABLE HERE - THANK YOU! Bought these to have on hand at Thanksgiving, but they may not make it that long! These little bursts of mint robed in dark chocolate are the absolute treat. Individually wrapped, so share with your friends, or save for yourself. Five pieces equal one serving. The chocolate is sweet without being cloying and the mint is very bright and â€“ well, minty. A good peppermint flavor that leaves you wanting to breathe in to absorb it over and over again. All in all, a very good candy that is more for adults, but can be enjoyed by the kids. But save it for the adults! ProsIt's chocolate and mint - perfect! Always happy with this delicious mint....service your company provides and how prompt the product arrives. Absolutely the best candies ever !! very good...do you have bulk packaging for these candies avaiable? Do you have bulk amount avaiable to purchase of thid candy? I love these mints and haven't been able to find them anywhere around me anymore. This was a great place to order them from. A good price and quick delivery. Will definitely order these from here again. Purchased since I enjoy Fazer Mariannes and thought that inverting the formula (mint on the inside, chocolate on the outside) would be great. Unfortunately, the chocolate coating is pretty tasteless and forgettable. The mint paste inside is good, but doesn't make up for the chocolate. Skip these and buy the Fazer peppermint bar or Mariannes instead. Best dark chocolate mints I've had. So glad to have found them at Finn Style. We looked all over for these mints, but the shipping was twice as much as the cost of the item! What a good deal! My mother loves these mints and this is the only place we can find them. They are inexpensive and delicious. Your delivery was very fast. We will certainly be buying more! 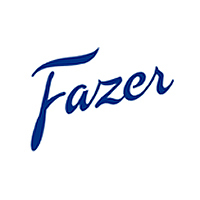 FAZER mints are back in the USA!! These mints are the real thing...just like the mints available at Costco about 20 years ago. I used to buy those bulk mints and put them inside glass trees for nice Christmas gifts. Now they come in tiny boxes- about 1/2 the size of how Target used to sell them about 5 years ago. Why the distribution in the US is so scarce is hard to fathom as these are the finest mints made. They are decadent dark chocolate with liquid mint centers. Andes is pedestrian. Fazer is for royalty. No joke! This is my second order of 10 boxes. I know there is a loyal following out there for these mints. Let's see them available in bulk sizes. I'm trying to do my part...smile. Thanks to Finnstyle for making them available. ProsYou will not find a better mint anywhere. ConsTiny boxes! Let's see more options for purchasing larger quantities! I buy these when I'm in Finland. So glad I can get them here. ProsDelicious dark chocolate and creamy mint. These are without a doubt the best mint chocolates with both flavors blending perfectly. Great for serving after dinner. Oh my how delicious! I discovered these in a small restaurant in Youngstown Ohio over 30 years ago. Haven't seen again until I found them on the internet. Best peppermint candy you will ever eat! And the rich dark chocolate is to die for. I recall having and enjoying these candies a while ago and had the opportunity to enjoy them once again after purchasing them at the retail finnstyle location. What a treat! The chocolate and mint combo is very delicious, with the liquid filling oozing upon the first bite of the chocolate shell. Everyone in my family loves their taste, which makes it difficult to keep around for very long! Best chocolate-peppermint creme candy ever ! If you like top quality dark chocolate (NOT bitter at all) and peppermint creme, you will love these candies from Finland. I've been eating them for years, with time-gaps when I could no longer find them. They ARE expensive, but so satisfying that they're well worth it ! Either pop the whole thing in your mouth, or be careful because the peppermint creme inside is such high quality that it RUNS----no paraffin in these babies !! Strongly recommended !!! Consnothing----they're worth every penny ! Very pleased to see that Finnstyle carries the Fazermint Chocolate Creams. We received our first box from relatives visiting from Finland. Love the creamy mint filling! Thanks Finnstyle! The best mint chocolates ever! These are absolutely delicious and I am delighted that I can finally get them shipped to Australia. Thanks FinnStyle! These little mints are filled with large flavor. I keep them in the freezer to chill the mint filling and harden the chocolate shell. They are quite refreshing and my favorite Fazer! These are mints that I have purchased annually for my son-in-law for Christmas since my visit to Finland in '89. He asked for them as a souvenir that year. I purchased them then and have ordered them online ever since not being able to find them in local stores. Target used to carry them as well as a shop in the Amana Colonies near here. The chocolates are always a big hit and do NOT last long when Dan opens them! Thanks for the great service. They arrived as advertised on time and in great shape! I became hooked on these mints during a college study abroad in Sweden. A Finnish classmate of mine introduced them to me and they've been one of my favorite treats ever since. So glad FinnStyle carries these! I used to buy a tub of these for my mother every Christmas. Is there a chance you will have the tub available this year? Why are they so hard to find??? Hello, Unfortunately we do not sell tubs - just the boxes. They are only brought into the US through a company in Chicago that distributes to a limited number of companies. We are lucky to be one of them. How many individual pieces are in this 150g box?